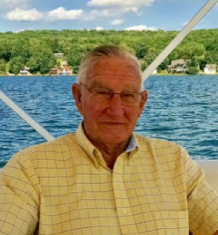 John Richard “Jack” Bray, 84, of Sterling, passed away March 19, 2019 at Hospital District #1 of Rice County, Lyons. He was born on January 20, 1935 on a farm near Belleville, Kansas, the second child of Richard and Dora Saip Bray. Jack graduated from Belleville High School with the class of 1952. He served in the United States Army from January 1957 until October 1958; and in the Army Reserves until January 1963. Mid-year 1959, Jack met Nettie Trost. They dated at the skating rink and married on September 26, 1959. Jack often teased, “And no one thought it would last!” He truly lived out his commitment to the love of his life when she suffered a major stroke in 1979. His devotion never wavered and his selfless care for his bride endured to the end and was an inspiration to many. In addition to caring for the love of his life; Jack enjoyed camping, going to the lake, trips to the casino, and snooker nights. Jack owned and/or managed service stations most of his working career. He managed stations in rural Manhattan and Fowler, Kansas; and then purchased Superbe Oil Company in Sterling in 1968. Following Nettie’s stroke he carried mail on a rural route for a few years. He then became manager of the Sterling Co-op service station offering the excellent customer service he was known for, retiring from the Co-op in 2000. In support of the community, Jack served on the USD 376 School Board during his children’s school years for 12 years; served as a Rice County Commissioner following his retirement for 12 years; He was a member of the First United Methodist Church, Sterling, where he served on various boards; past board member of Sterling Recreation Commission; past board member of Wheat Belt Girl Scouts Council; and member of Moose Lodge #982 of Hutchinson for many years. Jack is survived by his wife, Nettie Bray of the home; children, Cindy Wittich and husband Darryl of Mt. Hope, KS, Wendy Fiehler and husband Steve of Sterling, KS, and Jeff Bray and wife Kristen of Penn Yan, NY; sister, Kathy Begnoche and husband Gene of Downs, KS; brothers-in-law, Leo Ninemire of Concordia, KS and Richard Van Wey of Willard, MO; grandchildren, Stephanie Edgington and husband Robert, Wesley Wittich and wife Courtney, Chance Fiehler and wife Sarah, Jacob Fiehler and wife Dakoda, Kodi Fiehler and (Evan Barber), Tyler Bray and Kelly Bray; great-grandchildren, Graysen and Eliora Edgington, Nina and Nicholai Wittich, Harper and Stella Fiehler, Trip, Vann and Addy Fiehler, and great-grandchild is expected in July. He is preceded by his parents; siblings, Donald Bray, Mary Lou Ninemire, Gene Bray, Debra Van Wey, and infant brothers, Larry Kent Bray. Funeral service will be at 1:30 P.M., Saturday, March 23, 2019 at First United Methodist Church, Sterling, with Pastor Amy Foster officiating. Burial will be at Sterling Community Cemetery with military honors by the Ft. Riley Honor Guard. Visitation will be from 2:00 until 7:00 P.M., Friday, March 22, 2019 at Birzer Funeral Home, Sterling with family present from 5:00 until 7:00 P.M. Memorials may be given to Sterling Presbyterian Manor-Employee Appreciation Fund in care of Birzer Funeral Home, Sterling.